When Should Indie Authors Publish a Second Book? Reader Question: When Should Indie Authors Publish a Second Book? Last week, a question from Sunayna Prasad came in about building a fan base and how it affects series publishing. Basically, she wanted to know if she should publish the second book in her new series right away, or if she should wait until she has more fans or readers of the first. "I am writing a sequel to my published book. It didn't sell a lot, but it got a lot of positive reviews, all from strangers. How many fans should I have (whether they bought the book or I gave it away for free) before I publish my sequel. I sold somewhere around 53 copies since a year and a half ago. My goal is to have at least 800 fans before publishing my sequel. The title includes the phrase, book 1, so readers already know that there will be another installment. But is 800 too many for the number of books I have sold?" How Many Fans Before Publishing a Sequel? Do you need 800 fans before publishing the next book in your series? 1000? 10,000? Here's a great thing about being an indie author: you don't have to wait around for stats on Book One before publishing Book Two. Now don't get me wrong. Those stats are important. And you should never neglect market research. But when it comes to writing a series, there's another marketing consideration. Your second book has the potential to help you sell your first. But when you have a book out and you note that it's "Book 1" in a series, it's reasonable to assume new readers are going to look up other books in your series before buying. It clues them in to what they can expect. And finding that you haven't actually released anything else yet can be a turn-off. Personally I wouldn't add "Book 1" until at least one other book in the series was released, in your next edition or a cover update. Avoid setting readers up for disappointment whenever possible. By releasing your second book quickly, you have a chance to reach die-hard series readers who only take up a new author's work if they know they'll have another book to move on to. 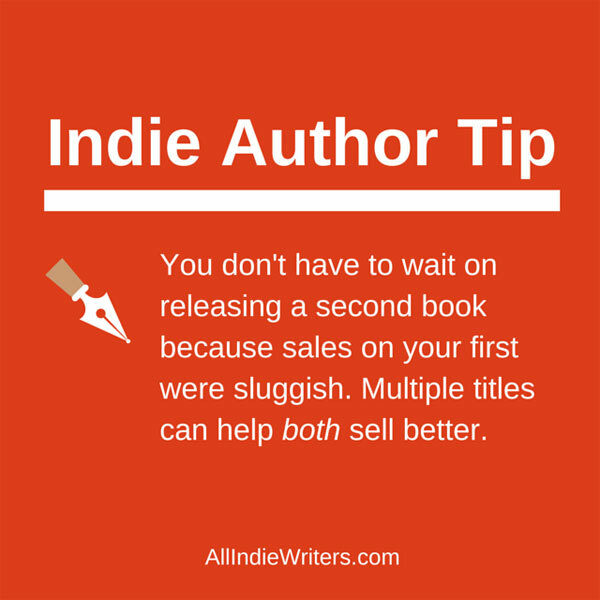 This is why some indie authors don't even release their first books until they have a second, or even a third, ready for release at the same time. So Sunayna, if your second book is almost ready and you want to launch it sooner rather than later, go ahead and do that. While I can't speak to the book itself because I haven't read it (and I don't know how big your audience is compared to buyers because you didn't mention how many free copies you gave away), I can tell you that your second book can be a great marketing tool in building a bigger fan base for the first. If you decide that you would prefer to wait, that's an option too. Just don't let waiting turn into a waste of time. Take that time before your next launch to do some serious digging. Find out why people aren't buying more. Look for ways to improve your book marketing plan. Then you'll be in a much better position to promote your new book and increase sales on your first. Now let's take it to the community. Do you publish multiple books at once to capitalize on the instant gratification readers often want? Or did you wait a while between your first and second books in a series? How did it work out for you, and if you had to do it again would you do anything differently? Tell me your thoughts in the comments. My debut novel came out in May 2011. I had not decided on a series or a set of stand-alone novels linked by topic. .My debut sold well for an Indie writer who did little marketing, with help from the usual sales of debut novels to friends and colleagues. The second book in the set never sold as well but aided sales in the first. Then I wrote a series The Legacy of the Queen of Scots. I am about to publish book 4 in the Legacy series. Each time I launch, sales boost in my debut The First Marie and the Queen of Scot, and the first book in the Legacy series, The Midwife’s Secret: The Mystery of the Hidden Princess. The pattern suggests people who read the new offering go back to the beginning. In 1 of the 4 years I have been doing this, I hit the bottom margin of what some folks call the Mid-List. 95% of my sales are in ebooks. In early 2014 I launched a new series in another genre, as J.D. Root. i am about to publish the second in the series. The first was #1 in the sub-genre for several weeks and then fizzled. I am 76 years old, so I need to hurry. i waited a year. not because of any other reason but that’s how long it took to write, edit, create the cover, etc. i write non-fiction so it might go faster than someone with fiction? I just published my first novel two month ago. I have another story almost ready to be made, but i haven’t yet seen anything come from my first book. if i don’t see money with my first book, maybe i shouldn’t bother publishing my second book. That’s certainly up to you Christian. But take some time to consider why your first book hasn’t succeeded (yet). Sometimes it’s an issue of quality. More often though, the biggest issue I’ve seen with indie authors is they failed terribly on the marketing side. Effective marketing campaigns begin before your book is ever released, and they continue long after it’s published. If sales aren’t coming, you need to figure out why and tweak that campaign or marketing plan. Indies often have more luck when they have multiple titles available because they can lower the price on one as a way to pull readers into their work, then up-sell them on the next title at a “normal” price. So if your two books are related in some way, that could be a strategy to consider.